It’s been almost 6 years since I’ve upgraded my running technology. I know, bad for someone who used to work for a college of technology! 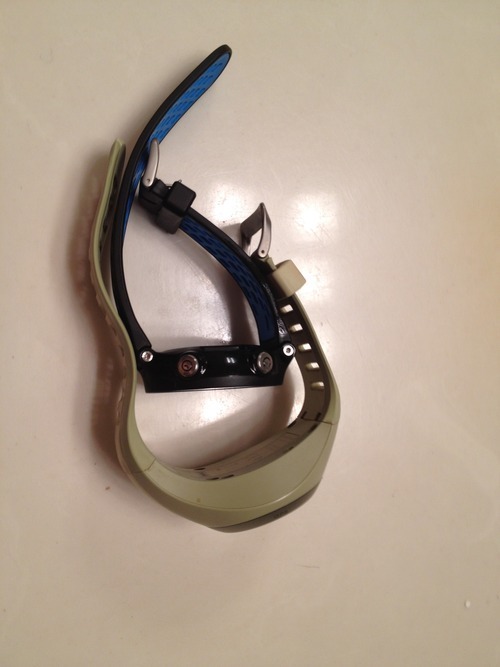 But I like to use products until they are broken or no longer useful, and it was just in the past few months that the band on my Garmin Forerunner 405 finally began to rust. So after getting my budget back on track after my move last winter, I decided to splurge and see what was on the market now. 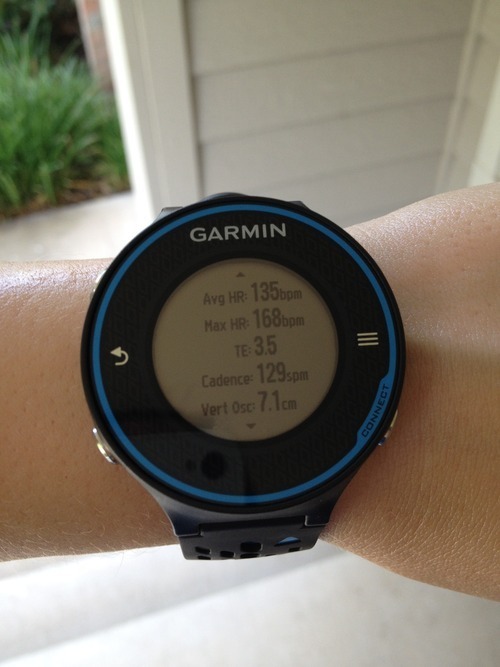 If you want to read up on all the features, check out Garmin’s site. What I’m planning to do here is tell you about some of the nifty features I discovered on my first run with it, and show the improvement over the last model I had. It’s a wee blurry as the screens go by fast (and my phone clearly focused on my shoe! ), but I’m at 34, which is towards the top of the good range for my age. This was just an easy run though, my first since straining my hamstring training last weekend, so I was just happy to have a baseline for my future runs. It’s nice to get a read on the fastest pace during my efforts, as I want to improve there this year. 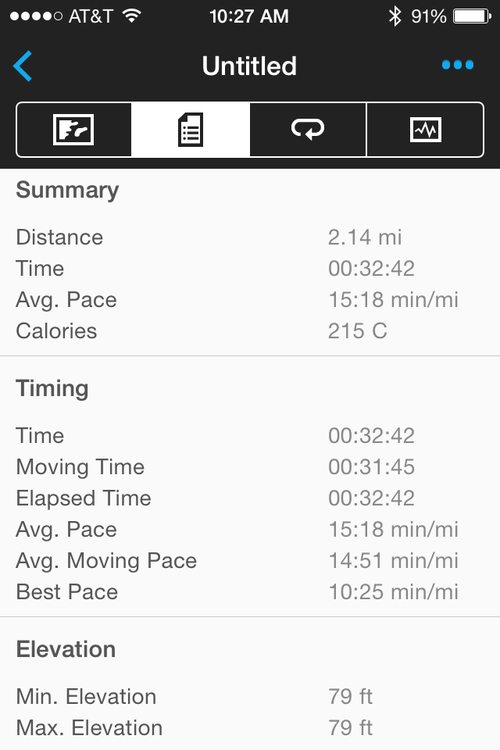 In fact, it has that data from the runs uploaded from my previous device too! (My run a few weeks ago I had an 8:40 in there!) 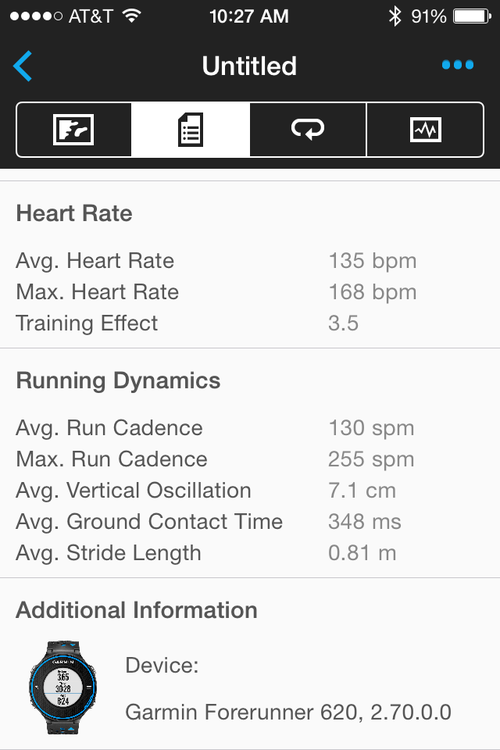 But the Running Dynamics section is new. I look forward to reading up on that. I suspect my cadence is decent but I could use to get the stride closer to 1. Next is the actual unit. New one is nestled inside the old. 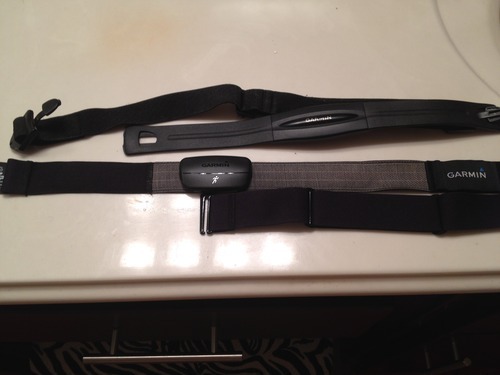 It’s MUCH lighter, and the design of the band allows for a tighter fit. No more jiggling on the run! Even the chargers are an improvement. Old is on the left, new on the right. Old one you had to plug into the wall, new one is by USB so can plug into computer or my iPhone/iPad chargers and plug into wall. 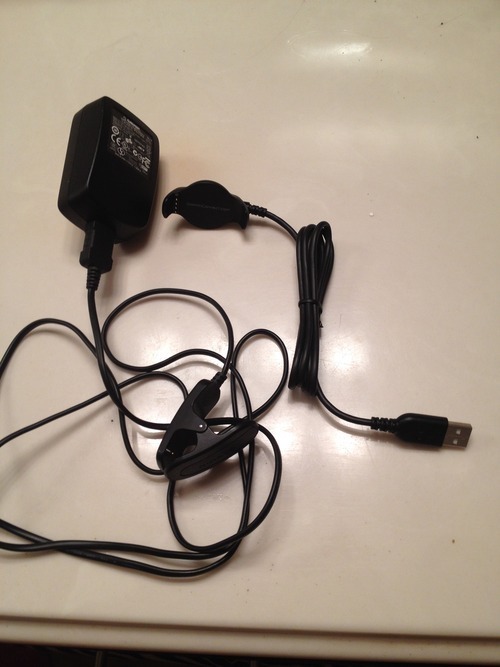 They sell an adaptor for that too if you don’t have such an option. 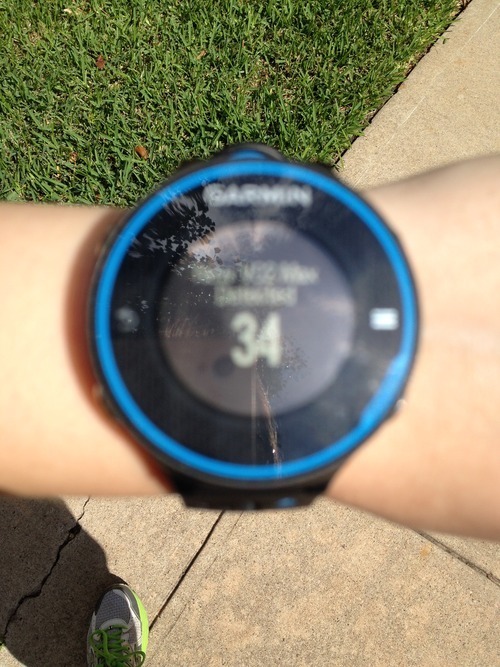 Other neat features I noticed: easy start (just hit the run button and go, hit again when done to stop), the watch notifies you your pace of each mile as you go, and it also tells you if you’re recovering well on your interval breaks. I still need to program in different training programs, possibly the only negative of this versus the old one which had some built in. I may also just keep the old one if I get a bike, as it had bike tracking where this one seems to just be runs. All in all, I’m happy I upgraded and am really looking forward to training! I’ve gotten off track from #10kaday. I was doing great the first three months of this year, averaging 10,000 steps a day for the month. If I had some days that I was short, I made up other days. My one and only “New Year Promise (I don’t like resolutions)” was going great. I only averaged about 8400 steps a day in April, and this month I’m hovering around a 7900 steps a day average. But, I weigh the least I have weighed all year (down 8 lbs. from Jan. 1 and 10 from my heaviest point in February). So, what gives? I wasn’t very active at all last fall. The steps goal was a good way to get moving this year. But the more I began weight training, the more muscle I’m building, which means more fat burning, even on days I don’t get as many steps. I really started watching what I eat in April. That’s when I did my 24 Day Challenge (results here). Which I look at as a lifestyle change, not a diet. I try to follow the clean eating rules of the plan even a good 4 weeks after finishing that adventure. I have started (lightly) race training again. This means long runs on the weekend. Which doesn’t make up for all the sins of an inactive week, but it helps some. I’m still going to do my best to get as many steps in a day as possible, but a new goal is on the horizon for me: I want to be a faster runner. 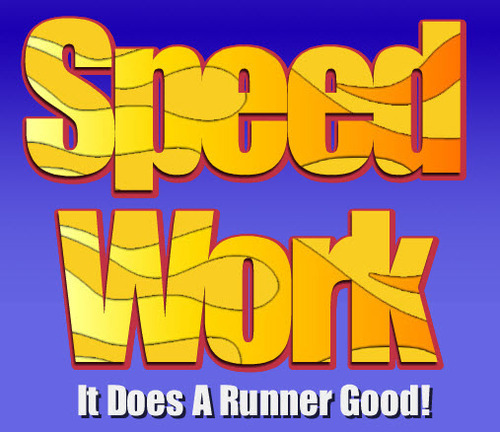 I ran my best 10k ever last month, and I have at least one 5k coming up this summer before I truly start the half marathon training. 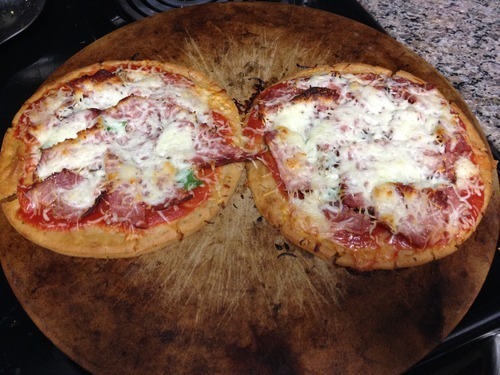 I tried pizza crusts made with rice and tapioca flour tonight. I do not typically seek out products with the “gluten free” label. I don’t have celiac issues. I know people who do have to do this, and I know it is definitely a challenge for them. But in seeking an easy dinner option for a semi-busy week, there were two options at my local Sprouts for a pre-made pizza crust: one with enriched flour, and this one. And there were plenty of them in stock, so I was hoping I didn’t take away from anyone who truly needed it. Even though I’m not currently on my challenge, I am trying to eat as close to the rules of it as I can when I have a say-so. That means minimizing processed foods, hence the choice on the pizza crust. It definitely has an interesting flavor, much like the almond nut crackers I have started to enjoy snacking on (even before my challenge!). I’ve noticed the less I eat white flour, the less I crave it and when I do eat something made with it, it doesn’t taste as good (that is, except for desserts…desserts still taste good…but I can get by with a few bites only!). This may not become part of my regular menus, but I’m glad I tried something new so I knew what it was like. And I have a serious respect for those who must eat this way and am glad we are starting to see more options for them!